If you love tinkering around with recipes in the kitchen, I am pretty sure that some of the equipment that you would need to have would be the kitchen scale. After all, certain recipes would need you to be able to use just the right amount of flour or sugar, and too much or too little would throw the taste away. Well, it seems that there are different kinds of smart scales out there, but Perfect Company would like to join the fray with their latest Perfect Kitchen PRO smart scale. 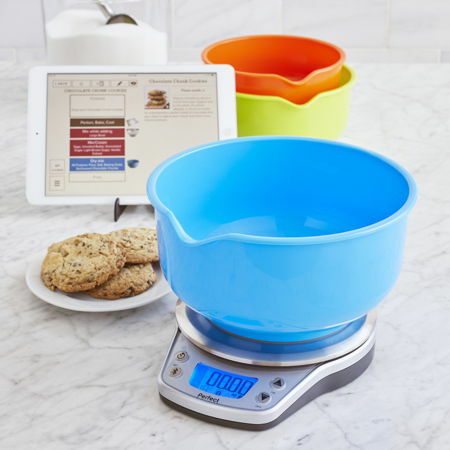 The Perfect Kitchen PRO smart scale is deemed to be the ultimate smart scale and interactive recipe app system, where it claims to be able to provide everything that home chefs need in order to create perfect drinks, baked goods and blended items. The Perfect Kitchen PRO available exclusively at Sur La Table stores across the US, as well as online if you are interested. Not only that, the Perfect Kitchen PRO smart scale will play nice with the slew of Perfect Company’s recipe apps: namely Perfect Drink, Perfect Bake and Perfect Blend. Professional chefs and bartenders have long figured out that the secret behind perfect dishes and cocktails is precision measuring of ingredients, and this is one smart scale keeps things simple for anyone and everyone to accomplish the same professional results right in the comfort of their own home. One can download a trio of free Perfect recipe apps to their Apple, Android or Amazon Kindle device to get started, and the apps boast of over 1,000 taste-tested recipes that have been developed by in-house chefs to choose from. Once a recipe is selected, it can be dialed down or up to make a smaller portion or to serve a hungry crowd, depending on the situation. There is also a built-in timer that keeps track of mixing, shaking, blending and baking times. The Perfect Kitchen PRO smart scale will come with an asking price of $129.95 a pop.